When my sister and I were little (4-6 years old) our parents used to take us to Gene’s Italian Restaurant in Milford, I want to say it was on Central St. but I could be wrong. I remember inside was interesting (to me as a kid anyway), kind of dim with curtains and a stage of some sort and they’d have someone walking around the diningroom playing an accordion. My parents liked to take us there because you could get spaghetti and meatballs for $1.50. You might be thinking, “Okay, okay what does this have to do with WMRC? Jeez.” Well, this bumper sticker is the only direct connection I have to Gene’s. I can’t imagine how my parents never take a picture and documented the family eating such a bargain meal, but somehow it never happened. 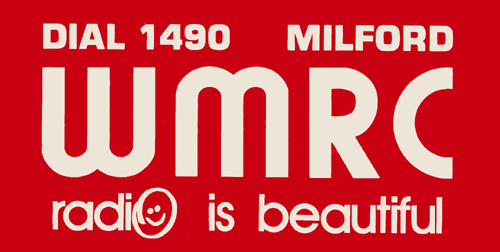 There was a pile of these WMRC bumperstickers by the door and the little smiley face appealed to me so I took one. When I got home, I stuck it on my night table. This night table eventually got moved down to the basement and through the years when I’d go down there to look for something and see this and think of Gene’s Italian Restaurant. I ended up removing the bumper sticker and painted the nightstand, which somehow is now my current nightstand, and laminated this sticker since I think it’s the only one in existence, not that any one cares, but I do. I keep meaning to try to listen to WMRC but never think of it since I’m a die-hard WBZ girl, so when I’m on the AM dial, I’m always at 1030 but looking at their programming, I might give them a try. I feel I should after having their bumper sticker for 30 something years. What a memory – I remember Jean’s – yes, it was on Central Street and they did have an accordian player! I remember Jean’s as well. If memory serves me it used to be my favorite place for spaghetti other than the Union Cafe. My dad used to be a dj for WMRC back in the 70’s. He did a jazz show.